A dark epic fantasy inspired by The Prince and the Pauper and the fairy tale The False Prince, from bestselling author C. J. Redwine. 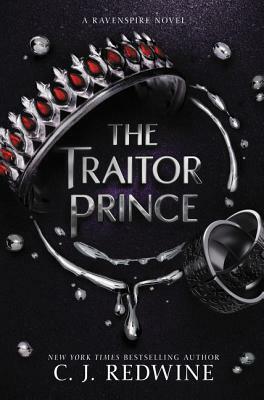 Perfect for fans of the Court of Thorns and Roses series and the Wrath and the Dawn duology, The Traitor Prince is a thrilling new standalone novel in the Ravenspire series. Javan Najafai, crown prince of Akram, has spent the last ten years at an elite boarding school, far away from his kingdom. But his eagerly awaited return home is cut short when a mysterious impostor takes his place—and no one believes Javan is the true prince. After barely escaping the impostor’s assassins, Javan is thrown into Maqbara, the kingdom’s most dangerous prison. The only way to gain an audience with the king—and reveal Javan’s identity—is to fight in Maqbara’s yearly tournament. But winning is much harder than acing competitions at school, and soon Javan finds himself beset not just by the terrifying creatures in the arena but also by a band of prisoners allied against him, and even by the warden herself. The only person who can help him is Sajda, who has been enslaved by Maqbara’s warden since she was a child, and whose guarded demeanor and powerful right hook keep the prisoners in check. Working with Sajda might be the only way Javan can escape alive—but she has dangerous secrets. Together, Javan and Sajda have to outwit the vicious warden, outfight deadly creatures, and outlast the murderous prisoners intent on killing Javan. If they fail, they’ll be trapped in Maqbara for good—and the secret Sajda’s been hiding will bury them both. C.J. Redwine is a New York Times bestselling author of YA fantasy novels, including the Ravenspire series of fairytale retellings and the Defiance trilogy. She’s still waiting for her letter from Hogwarts. Currently, she lives in Nashville with her husband, five children, three pets, and a wardrobe that stubbornly refuses to lead to Narnia, no matter how many times she tries. To learn more about C.J., visit her website at www.cjredwine.com.